Yes, even we eat Toblerone. We love it because it's one of the hardest Christmas presents to disguise. (Take That, Santa!) 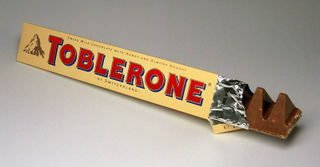 Why, we at Darth Wiki always condone productivity in being a Troll to others, and being bitter, snarky and mean, but first you have to have a Toblerone, because Real Men Eat Toblerone. Besides, even we can't deny that they're DELICIOUS. To say that we Darth Wiki Tropers don't like Toblerone is like saying that Bowser likes Mario. It just ain't true, man. It just ain't true. As you eat a bear. We always have to have a bitter day. Have Toblerone to spite another's way. Toblerone, because villains won't settle for less.